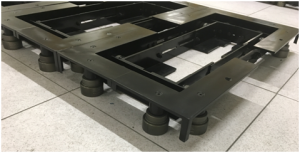 Seismic control plinth designed to minimize effects of earthquakes in IT devices, by reduction of acceleration, useful for Legacy and New Development Data Centers. Installation on live Data Centers by our trained team upon request. 2 – Elimination of high frequencies by elastomeric M1 Class soles upon request. This sole is non-slip and ensures the protection of raised floor. 3 – Incorporation of safety dampers for overload up to 10 times the nominal load. Easy size adaptable to rack dimensions depending of vendor and model. Easy fixing to any rack in the market.